At some point before her marriage in 1925, my paternal grandmother – the one I never knew – took ship with friends for India (‘P.O.S.H.’) on a visit of evidently some months. The strange thing to me is that nearly every detail of this romantic rite of passage was so rapidly all but lost in family tradition. We do not know even whether Phyllis Elliott took her trip before or after the Great War; I suspect it was most likely post-1918 as at the very end of the Edwardian era my grandmother is supposed to have been working as nursemaid in the Scott household, looking after baby Peter, the future ornithologist, while his father sailed south to the fatal Antarctic wastes. By the time I met Phyllis’s surviving fellow-traveller in the 1970’s, that old lady could recall not a thing about the whole enterprise except that all their purchases and acquisitions¤ were smashed to pieces on the voyage home during a violent storm in the Bay of Biscay. I visualised exotic splinters and fragments of sandalwood, ambergris, nacre – “peacocks, apes and ivory” – all over the inner cabin floor. All that survived were a few Benares brass ashtrays (probably originally made in Birmingham for export as was then the eccentric custom) and a tiny stool inlaid with mother of pearl, beside which my infant father was photographed in 1928. And maybe it was Phyllis who brought home the sari which we discovered in her widower’s house when he died in the early 1960’s. A strange roll came to light, wrapped in brown paper and cellophane bags, emitting a penetrating odour of damp – and of patchouli, India’s own natural moth deterrent. But it was the old-style patchouli, which seemed to give out a much thicker, oilier, sweeter fragrance of that of today: modern patchouli is infinitely more sophisticated – airier, drier, more rarefied – but not so dramatic nor emphatic and certainly not as pungent. I daresay it is all to do with the process of refining, extraction and what have you. Anyway, we unpacked this bundle and out rolled yard after yard of exquisite cream raw silk, bordered in whorls of emerald green and silver. I remember it cascading down the front stairs from top to bottom, a rippling river of colour and scent, like a flowery meadow in spring. The only thing was, none of us really knew what it was. It was some time before its destined use dawned upon me. And by then it had gone, as things tended to do in our house – “melted away like butter in the sun” as my mother always said. The act brought the house down with the studio audience, but “you, the viewers at home” did not, alas, vote for the lovely lady’s return the following week. I thought then that the sari was the most romantic costume ever devised for woman and this was even without the benefit of colour television. I was told later how tricky it can be to wear – easy to trip, hard to manipulate, a little warm if you’re not used to all those bunched yards of fabric. I heard about the variations in arranging the sari, in the styles of different India states – the Gujerat draping for energetic movement or dancing; the gracious formal pleats of Bombay for more sedate occasions. The sari stores of Leicester began then to fascinate me as they still do today: the huge windows light up rainy days and dark winter nights with glorious waterfalls of gathers, sweeps, draperies and veils in beautiful buoyant bursting colours – turquoise, gold, viridian, flame, oyster, lime, copper, chocolate, scarlet, crimson and of course sugar pink – Diana Vreeland’s celebrated “navy blue of India”. And then the silks and satins, chiffons and taffetas are all over-embroidered and stitched and beaded with thousands of brilliants, metallic threads, sequins and rhinestones. A gorgeous hatch-out of Indian butterflies against the sobrieties of “Brentford Nylons”, “C & A” and the Co-Op. The other day I saw quoted in a book of grammar¤¤¤ an exciting line from Raymond Chandler’s The Little Sister – “She smelled the way the Taj Mahal looks by moonlight”. Some image to unlock the imagination! All the legends and factoids of India come spilling out – and all the scents. 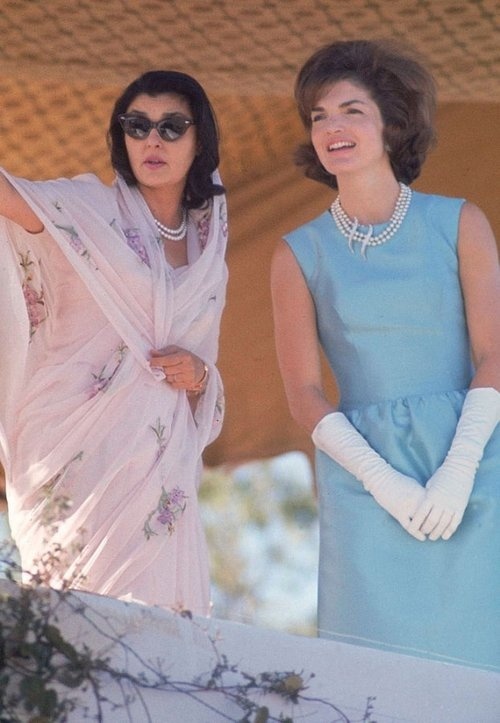 The Kashmiri lakes and their palatial houseboats; the fragrant sandalwood and ghee of the burning ghats; the gem mines of Golconda; those “pale hands I loved beside the Shalimar”; the Jewel in the Lotus and “The Jewel In the Crown”; George V and Queen Mary sweltering and gleaming at the Delhi Durbar; “The Mountain of Light” monster diamond kidnapped to become a radiant if unlucky star of the British royal regalia. I am thrilled by my friend Mr Singh’s memories of peacocks as numerous as crows screeching in the trees on his parents’ Punjabi farm; and progress reports from his Leicester garden flourishing and fertile with chilis, native herbs and spices. Expatriate Indians tell me of tuberoses and mangoes growing back home like weeds in suburban Calcutta back yards. Of the delicate dry fresh smell of Darjeeling tea plantations and the stronger redolence of Assam. Of the addictive mouthwatering spiciness of tuli, the sacred medicinal Indian basil, and of huge garlands of living flowers slung around the necks of visitors; and of ‘cus cus tatis’ – woven blinds of vetiver grass, soaked in water and hung at the windows to repel heat and insects while cooling and perfuming the interior of the house. That fleshy musky indolic jasmine; the carnal sensuality hidden in tiny white stars – and the flamboyant bitter faint sickliness of the fluorescent orange marigold. And thus this hidebound old westerner Lemon Wedge imagines, pictures and smells India in his own mind. But now, take heart! we all have the privilege of having our noses indulged and our brains expanded by the olfactory treasure house of NEELA VERMEIRE, newly arrived at LES SENTEURS and as gloriously varied and nuanced as Mother India herself. Why not pop round? You are only a dream away. ¤ which did not include husbands. I don’t know whether the search for a spouse had been one of the original intentions of the voyage out. In those days of the Raj, the “fishing fleet” of wise and foolish British virgins made regular sailings to India in search of suitable matches. In the event, my grandparents first met back in England on the occasion of my great grandmother’s funeral procession becoming jammed in a narrow Leicestershire lane. Phyllis was a lovely mourner, pale and interesting in black crepe; Mr Craven was young and dashing on his motor bike. ¤¤ dramatically & posthumously revealed to have been Paula Yates’s secret father. ¤¤¤ “The Elements of Eloquence” by Mark Forsyth. A stimulating read. ¤¤¤¤ “Night In Bombay”, first published 1940. LW has had a run of room themes over the past month. Maybe it’s because I tend to live outdoors if at all possible during the summer season, and so ponder more objectively on the rarely used shuttered interiors – and smell them more intensely when I come inside. And then of course each roomy reverie leads into another, in a dream-like enfilade of memory and reflection. Feeling decidedly unwell last week, and running a slight temperature, I Iay down during the morning¤ and my burning head and mild weepiness involuntarily took me back to schooldays in the late 1960’s. Does being ill always fill you with a sort of sick nostalgia? Does this connect, I wonder, with the idea of ultimately “Going Home” at “End of Retirement”? Fifty years ago, away at boarding school, the business of Being Ill¤¤ was hedged around with a certain ceremony. You felt something “coming on” – hoped, imagined, or feared that it was coming on – and took yourself up the lane, past the staff garages and the Art School to the San. This was a great stark redbrick Victorian building, most of which stood vast and unused except in times of epidemic. Several boys were supposed to have died in there over the years; there was a small mortuary in the yard. (Or did we just say it was a morgue? I cannot remember, but I seem to recall the fatal letters spelled out in decorative brick). Anyway, you pushed open the heavy oaken front door and passed through the veil into Sister’s frostily antiseptic clinic, full of such unlikely accessories as forceps, and kidney bowls awash with witchhazel. Off you shuffled, down the twilit linoleum-lined corridors, through a couple of swing doors and into this room at once so welcome a refuge and so tearfully dreary. They kept it very hot to make it as much like a real hospital as possible, and obviously it would not have done to have had it too welcoming. I don’t think I ever saw the curtains at the long windows open: what I remember best is the feeling – rather like that of the child Jane Eyre – of walking into a chamber filled with a thick prickly vermilion mist. A dozen black iron bedsteads were made up with red blankets. You took off your shoes and lay fully dressed on or under these covers, all itchy-scratchy, in a fever of heat and relief, sometimes even infection. And oh, the smell! A fog of hot wool, bleach, Dettol, warm bodies, embrocation, institutional cleanliness (never a cosy odour), floor polish, distant cooking (for the resident patients lying upstairs) and radiators. Do you remember the redolence of those heavy old radiators? Very singular – especially if coated with gloss paint which used to soften enough to encourage the peeling off of strips by the bed-bound in a stupor of ennui. I don’t believe meals were laid on – we were after all being observed for germs: we were not yet formally initiated into San life. But, every once in a while, a genial orderly named Carlos would push a soft dry mop over the bottle green lino and under the beds; then he would offer one a cup of tea, served with a Rich Tea or Digestive biscuit in the saucer. Another evocative aroma, for the tea came strong and rich in tannin: it always had (like all school tea) a definite but never identified chemical note to it, smelling of a peculiarly raw sort of disinfectant. People said this was bromide: to keep us calm, d’you see? But we were none of us calm in those years. By late afternoon, after a couple of naps, one was often feeling much better and even disposed to chat (strictly forbidden – “you are SUPPOSED to be unwell…”) with the shadowy lump writhing or prone on the next bed. The whispery gloom encouraged intimate confidences: you’d remember these revealing conversations for years – “I was in the Day Room with him in 1968 and he confessed that…”. Around 5 pm the doctor was brought round in pomp with the power of life and death in his hands. This meant either admittance to the wards: “Go and fetch your things” – or instant discharge: “Go and have your supper”. And nine times out of ten, that was that! Off you scurried, headache gone, all ready for a warmish nourishing meal of macaroni cheese with fried bread and cocoa; or meat balls in a strangely coloured sauce served with chips. Plenty of bread and marge to it. School days were absolutely exhausting – mentally, physically and emotionally – and there’s no doubt that eight hours lying down did much good. My parents used to say “You were always SO CROSS when you came home at the end of term….” but none of us at the time, experts in tiredness though we all became, correctly diagnosed this at the time as terminal fatigue. ¤ just like Elsie Carr on Mrs Worrett’s purple ‘lounge’ in ‘Katy’. …blinds a Nazi invader with pepper, then splits his skull with the kindling hatchet in WENT THE DAY WELL? (1942). She’s Mrs Collins, postmistress at the idyllic village of Bramley End; he’s one of a German unit who have infiltrated the place during the Whitsun weekend (May 23rd – 25th) of 1942. They’re in British uniforms and all speak & understand English … save one. If that situation rings a bell then you’re probably thinking of Jack Higgins’ THE EAGLE HAS LANDED filmed 36 years later. Graham Greene wrote the story for this one, it was produced by Michael Balcon and artfully directed at a gallop by Cavalcanti. Music by William Walton. I discovered this movie about 20 years ago and was amazed by the atmosphere, the extreme violence, the pace and the infinite subtleties of the propaganda. The film in told in flashback. 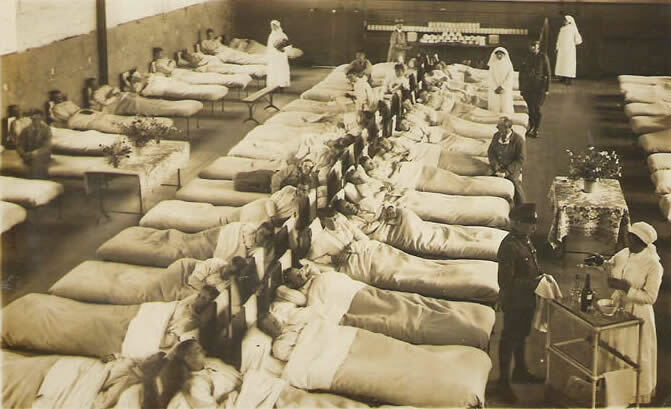 A framing talk to camera by Mervyn Johns, showing us German graves in a rural churchyard – “they wanted a bit of England and this is all they got”, emphasises that we are looking back at trauma from a position of security “after the war was over and old Hitler got what was coming to him”; after a living nightmare broke out in a toy village which learned to grow fangs and claws. Thus reassured – for when WENT THE DAY WELL? was first released in 1942 the outcome of WW2 was very far from certain – contemporary British audiences were taught a number of salutary lessons. Recently this film has much revived and discussed, the consensus being that it was designed essentially as a morale-boosting exercise showing all sections of society (in a time still obsessed by class) seamlessly bonding to defeat the invader. I see something very different. For WENT THE DAY WELL? seems to have been intended – under a thin veneer of roses round the door cosiness, and even comic touches – to frighten the life out of everyone who saw it. Imminent danger of invasion had passed in 1942 but was by no means gone, and it is never explained how the outfit of 60 Germans have penetrated Middle England: “the forces of evil” have come like a thief in the night or like Dracula, manifesting in a mist. A terrifying almost uncanny mystery in brilliant summer sunshine: all we know is, that they are here – now. The film is a brilliantly paced series of show ‘n’ tell lessons as clear as a medieval morality play. It can be highly subversive in its attitudes: roses have thorns; the sacred hospitality extended to strangers is unwise and likely to be abused; trust animal instinct and intuition, not common sense; don’t be afraid of making a fool of yourself. Take Mrs Collins and that axe. By killing the invader she is atoning for her slackness and want of vigilance earlier in the picture: losing telegrams, ignoring her feelings that something’s strangely amiss. 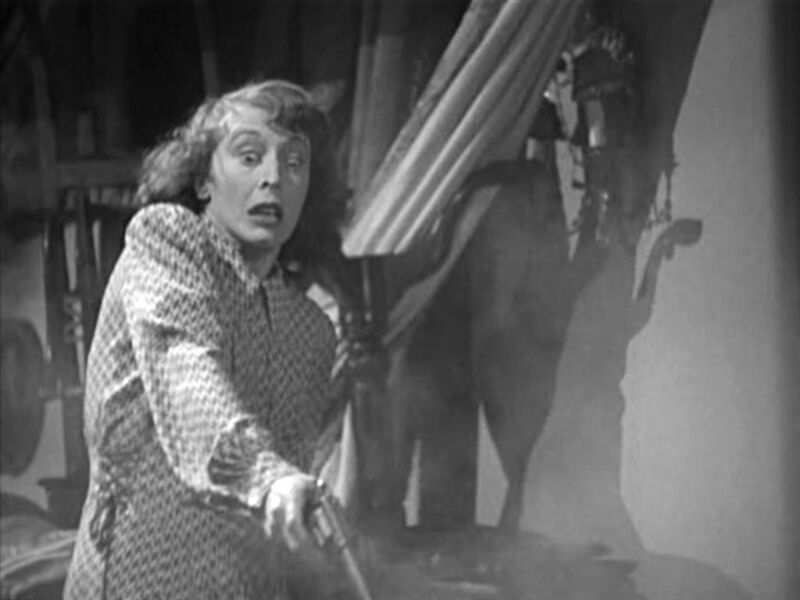 However, as her billet lies dead in the wreckage of the tea table (like all Nazis he’s been filling his greedy face at someone else’s expense*) the camera zooms in on his fallen revolver. The heroic but disorganised postmistress (ultimately responsible for all national communications) foolishly fails to retrieve the vital gun for future use. 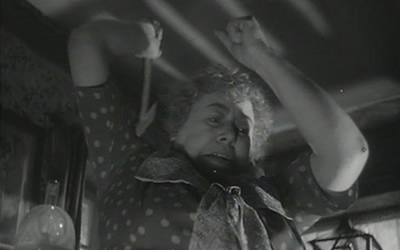 So that, although she tries to phone for help, she is consequently defenceless when the fallen man’s comrade bursts in and then and there atrociously bayonets “the old woman” to death +. 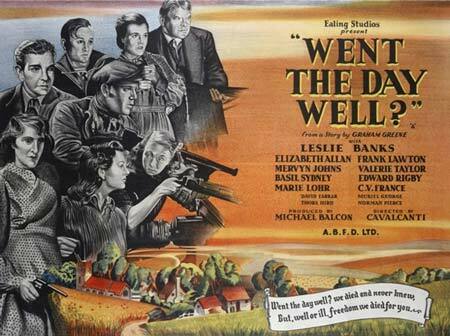 Nearly all the villagers who are seen being wilfully careless, lazy – (“it’s probably a Czech or a Pole…We’ll let sleeping dogs lie..”) – or heedless of official home front procedure are killed off by the scriptwriters. The deaths of these defaulters are given a final heroic gloss in this expert piece of public information – they are after all British, and native casualness beats heartless totalitarian efficiency hands down – but nonetheless it is made clear why they have to die. The Home Guard are wiped out because they ignore the tolling of the church bell** – “… couldn’t have. That’s the signal enemy parachutists have landed”. The village policeman*** fails to check the invaders’ credentials upon arrival – he’s more concerned with the pointless etiquette of being surprised while shaving – and is subsequently and aptly stabbed in the back by the quisling, Oliver Wilsford (Leslie Banks). The lady of the manor though full of politically correct platitudes (“you mustn’t waste food in wartime”) loftily brushes aside everyone’s all-too-well-founded fears – “it’s all right, don’t worry, it’s all right”# – and is blown to bits by a hand grenade; although she’s allowed to meet her end in an act of self-sacrifice which saves the local children. What’s more she’s played by national treasure Marie Lohr: all the faces (English AND German characters) in this film are carefully chosen as well-known & loved by contemporary British audiences, as though to ram home the message that this horror could happen to us all. ANYONE might turn out to be a Fifth Columnist or his victim. Familiar and beloved does not necessarily mean trustworthy. The children, however, the future of postwar Britain, are all calm, resourceful and alert: “you ought not to tell!” Young George¤, the cheeky Cockney evacuee who eventually raises the alarm and calls in the British troops, despite being shot in the leg, is one of the few unqualified heroes of the picture. There’s a sharp point here, too: it’s a village outsider – ” we always call them foreigners round this way” – who brings about the downfall of the true aliens, the Nazis++. It’s also George who is posed the question “Do you know what morale is?” The succinct answer is so outrageously racist by today’s standards that I dare not repeat it here. It’s still to be found on film, though – for now. So, what do we smell in this curiously compelling film? The stink of treachery that’s for sure; the smell of “the lowest of the low”¥¥ and the corruption which breeds the reek of blood, cold steel and bashed-in heads. But more movingly, there’s the magical pervasive fragrance of an idyllic English early summer, all the more beautiful for being in danger of being lost for ever under the heel of the invader. Despite, or maybe because of the black and white stock, evoking an instant nostalgia even in 1942, “the darling buds of May” were never more profuse nor so heavily scented. The exteriors were shot on location in the impossibly olde worlde village of Turville in Buckinghamshire. The camera dazzles the eye with leafy lanes, carefree cyclists, cornfields, windmills, flocks of sheep, dream cottages and church towers while nesting birds sing like mad on the soundtrack. The delicious aromas of freshly baked bread, roasting Sunday joints, plum tart, apples and cider fill the village kitchens: the smells of England, home and beauty. Jars of wild & garden flowers decorate every studio interior. Oliver Wilsford offers Nora a rose from a vase: the traitor’s symbolic snitching of England’s national flower. The climactic battle for Bramley End takes place in the exquisite water gardens of the Georgian manor house. As the marauders are gunned down amid the ponds and lilies we recognise another neat bit of dramatic foreshadowing: Hitler’s crossing of the Channel waters will end, we are told, equally disastrously. Smoke from the smashed-up manor rises with that of shells, rifles and grenades but also from priceless antiques piled up as barricades: the land girls throw a great clock – “grandfather!” – on top. Now is the hour of youth & renewal. A new downsized Britain will rise from the ashes: full of vigour, ruthlessness and raw courage to atone for the stale smug appeasement complacency of the old generation. The house’s mistress lies gloriously dead within her home, like a Valkyrie on her funeral pyre. Ambiguous ironies to the last! * “I don’t know when they’re more unpleasant: when they’re dead or when they’re guzzling our rations” . Nazis also boast a Fascist disregard for decent conventions: “I am not married but I have 2 fine sons who will soon be old enough to fight”. + Her dopey assistant Daisy – the village Holy Fool, played by future TV comic heroine Patricia Hayes – is smashed in the face by a Nazi: “Obey orders in future”. The shock of all this brutality is compounded by it’s being so totally unexpected in a British picture of this era. This is how everyday life will be, post-Invasion! ** there’s also a hint that the Home Guard are over-prodigal in food consumption – too many packed sandwiches for lunch. Later on, references to the Siege of Paris in 1871 remind audiences with grim facetiousness of the extreme straits of wartime starvation – “Rats were quite a delicacy apparently. I wonder which is the best end of neck of giraffe… “. Meanwhile drunken Nazi sadist David Farrar messily wolfs down an eclair. *** Johnny Schofield: indispensable and adorable character actor of the period. Expert in under-playing soldiers, batmen, barmen, coppers, next-door- neighbours, landlords and waiters. # and this after the vicar is gunned down in his own church. ¤ Harry Fowler: as an adult he has a moment in THE NANNY as the angry milkman seen off by Bette Davis (1965). ++ could George (the King’s name of course – and Washington’s) be an extended metaphor for the arrival of the USA on the side of the Allies? And an embodiment of the spirit of Blitzed London? ¤¤ better known for her stage work. Her final film role was as Mme Denise in Polanski’s REPULSION (1965). ¥ German-born Marlene Dietrich renounced her nationality in protest against Nazism, was proscribed by Hitler and fought gallantly on the side of the Allies. ¥¥ Queen Elizabeth the Queen Mother’s laconic definition of a traitor. “For dust thou art, and unto dust shalt thou return.” As I get older I find that the Adam and Eve story is easier to believe, makes more sense, than the fascinating but baffling intricacies of evolution. Take this new planet they just found out about; maybe a simulacrum of our own Earth but 1100 light years away and so (surely fortunately?) impossible to contact. And then apparently the science faculty “has now proved” that we humans are, in the final analysis, indeed “frail children of dust” created essentially from the atmosphere in which we frolic and into which we eventually fade and blend once more. So, after all, it is just as the Book of Genesis tells us – and before that, the Egyptian myth of the great god Khnum moulding the human race from Nile mud on the potter’s wheel. Quite comforting, really. No wonder then that dust has often had a supernatural feel about it: from the belief that the motes spinning in a sunbeam are dancing fairies or angels, to Sooty scattering “oofle dust” over Sweep and Soo to animate his conjuring tricks. If these minute particles of matter really are the working materials of the divine and the residue of mankind to date then they must all be pregnant with intense magical possibility. This links up with the old Western belief that the crumbling powder of ancient Egyptian mummies had terrifically efficacious properties in the cure of all ills. Countless bodies were excavated, exported and then sold off to be pulverised to dust by quacks, alchemists and apothecaries. The miraculous quality of dried corpses imbued with the arcane knowledge of a lost civilisation was intensified by the traces of redolent oils and resins used in their preservation. Papillon Parfums’ extraordinary ANUBIS, currently exclusive at Les Senteurs, gives an idea of the dizzy psychotropic power of such ancient perfumes as styrax, bezoin, frankincense, saffron and myrrh. “I will show you fear in a handful of dust”. There’s a romance in the dust that colours a butterfly’s wings; in a dusting of flower pollen; smelled in scented powder on the skin; even in the red dust, kissed by the sun of Africa, that sometimes blows up from the Sahara to coat London cars and windows with fine grit. But then there’s the old use of the word as a euphemism for faecal detritus: the original ‘dustmen’ were no more interested in collecting fairy particles than are our modern waste collectors. They spent their nights clearing the streets of human and animal filth which might then be recycled at great profit for use in the agricultural, chemical and above all the tanning industries. (This in turn explains why old fine leather had always to be heavily scented: in Tudor times most fashionably with the lavender oil which made Queen Elizabeth so sick). The average modern householder is principally concerned with the fine grey stuff that clings to a yellow duster. As regular readers will know, I’m currently having a major clear-out at home – and wondering whether Mr Crisp can possibly have been wrong: maybe the dust really does get worse after five years. Perhaps I haven’t left it long enough: there are areas on the top of bookcases where it seems very thick and still drifting, like grey snow or soft feathers – grainy swansdown from a doll’s grubby coverlet. Open London windows are very inviting of street and traffic dust but every so often a disconcerting hygiene specialist comes on the radio or TV to assure us that most of this residue comes from our own bodies as skin naturally and continually sheds like the sloughing of snakes. Dust has a hot powdery tickly smell, unclean and chokey but not dirty, exactly. It absorbs additional odours from individual atmosphere. The rooms of heavy smokers are dark with particles of tobacco and ash; think of the scented cosmetic dust of theatre dressing rooms or department stores; the electric energies of the meter cupboard. Nearly 60 years ago we used to take holidays in a tall narrow house on the East Coast which was full of light and of the dust generated from chronic wet and dry rot. In my mind now, I can push open the damp-swollen front door and inhale all the exciting stuffy fug. Wet sandy shoes and the dry sour smell of faded cotton indigo & saffron bedspreads; the hot sun-bleached chintz curtains; the overpowering reek of soiled nappies (that, said my father, was the wet rot) in the first floor back. My own tiny room was reached via the bathroom so it smelled cosily of Wright’s Coal Tar soap, hot water and thick green Vosene shampoo. It looked over the garden and the mud flats beyond: wafts of salt and stagnant marsh water came through the sash windows, along with an even riper aroma from the cess pool in the thicket of fuschias at the end of the lawn. There was a utility dressing table with nests of fascinating drawers lined with faded sheets of waxed paper and full of forgotten oddments such as extinct lavender bags, coloured pins, Halma counters and bits of broken jewellery. Green and gold painted papier mache trays were dotted about and had their own bitter papery-varnish scent – and taste. I was a great one for tasting smells when I was a child. There was an attic floor, too, with crumbling parchment roller shades over the windows and a huge boxed-in water tank: if you climbed up on this you could see rather too much of the empty haunted marshland and the grey North Sea for the inner comfort of a five year old. 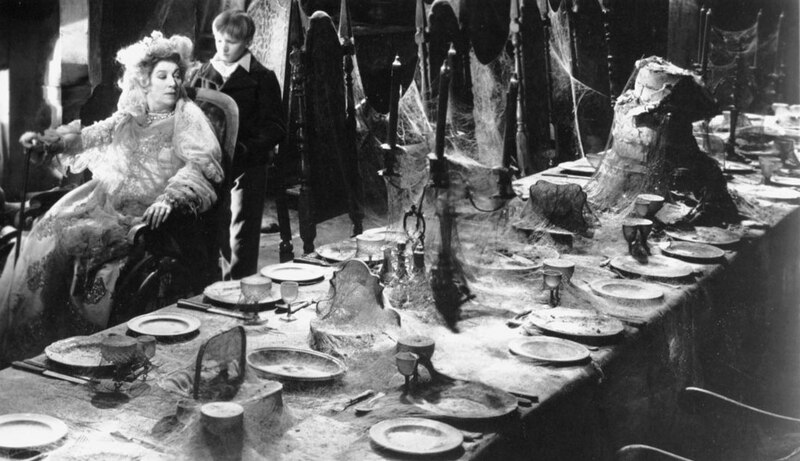 I hadn’t of course then heard of Great Expectations, but later when I saw the David Lean film at school (and everyone screamed the place down) I didn’t half empathise with Pip out on those terrifying wastes. I appreciated Miss Havisham’s ultra dusty aura too, “the death in life”: I am learning that we can fight dust but never conquer it for “to this end we must all come”. We’d best to keep it in check but ultimately (as with so much else in these funny old days) learn to embrace the dessication.